The UN Arms Trade Treaty that has been identified by observers as a flagrant threat to the second amendment and which Barack Obama is determined to sign has its roots in a 1961 State Department memorandum which explains how the United Nations will oversee “complete disarmament” of the American people under the ruse of preventing war. The UN Arms Treaty has caused so much controversy because it outlines a plan to target “all types of conventional weapons, notably including small arms and light weapons,” according to Forbes’ Larry Bell. Using the rhetoric of the threat post by terrorists, insurgents and “international crime syndicates,” the UN is busy trying to imply that all weapons are somehow involved in illegal activity on a global scale and should therefore be controlled and regulated by a global authority. “The manufacture of armaments would be prohibited except for those of agreed types and quantities to be used by the U.N. Peace Force and those required to maintain internal order. All other armaments would be destroyed or converted to peaceful purposes,” states the document. While the memorandum outlines a broader mandate to destroy national sovereignty, eviscerate national armies and institute the UN as the planet’s supreme authority with a world army, the document serves as a stark reminder that the plan for the United Nations to oversee the abolition of the second amendment has been in the works for decades. 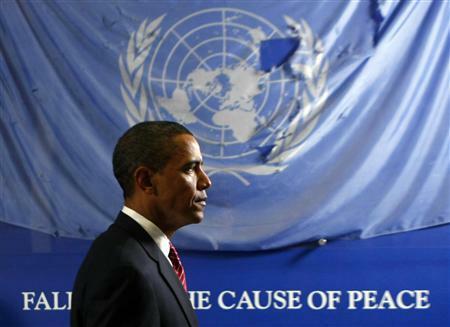 As Bell points out in his Forbes article, the threat of the Obama administration relying on a UN treaty to do what successive administrations have tried but failed to accomplish – taking a huge bite out of the second amendment – is by no means far fetched. After all, a plethora of UN treaties and international agreements have already stripped the United States of its sovereignty and its power to decide its own laws. The power to authorize U.S. involvement in wars and conflicts has now been almost completely stripped from Congress and handed to the United Nations. Following Barack Obama’s arrogant rebuff of Congress in seeking approval to strike Libya, during which he churlishly remarked, “I don’t even have to get to the Constitutional question,” Secretary of Defense Leon Panetta affirmed that the U.S. now requires “international permission” before deciding on its military policy. Other Obama-endorsed UN power grabs like the Law of the Sea Treaty (LOST) as well as Agenda 21 and sustainable development are also serving to decimate national sovereignty and remain almost completely under the radar. You only need to look at the European Union, which now crafts around 50 per cent of the laws made in member states like Britain, to understand how unelected global institutions can and have dictated policy on a national level. The UN Arms Trade Treaty presents an existential threat to the guns rights of American citizens and should be rejected for what it is – yet another attempt by the Obama administration, in the aftermath of the Fast and Furious scandal, to abolish the second amendment by stealth.